An early 59 on the bottom and a fairly late 59 on top. It’s hard to see a .1″ difference but you can sure feel it. Most players can feel a difference of .03″ That’s 3 hundredths of an inch. That’s the usual difference between a 62 and a 64. The difference between an early 59 and a typical 60 is three times that. I probably touched on this a few times before but I’m struck by the huge variation in neck sizes in a particular year. And that year is the oft venerated and sought after 1959. Everybody talks about that perfect 59 neck but the truth is, I don’t know which 59 neck they think is so perfect. Right now I happen to have a lot of 59 guitars. I have three 335’s , two 355’s and a 330. These guitars and a few others I’ve measured have wildly differing neck profiles. A28950 is a very early 335-January 59 and has that baseball bat neck like a 58 on steroids. It is around .93″ measured front to back behind the first fret and is 1.03″ at the 12th. That’s big. I have a 56 Les Paul with the same measurement. A31172 is a 335 from early September, I believe, and has the 59 neck that I associate with that “59 neck”. It measures .88″ at the first fret and around .98″ at the 12th. I also have A30877 which is a 355 and has the same profile (but has a much earlier FON-probably April). 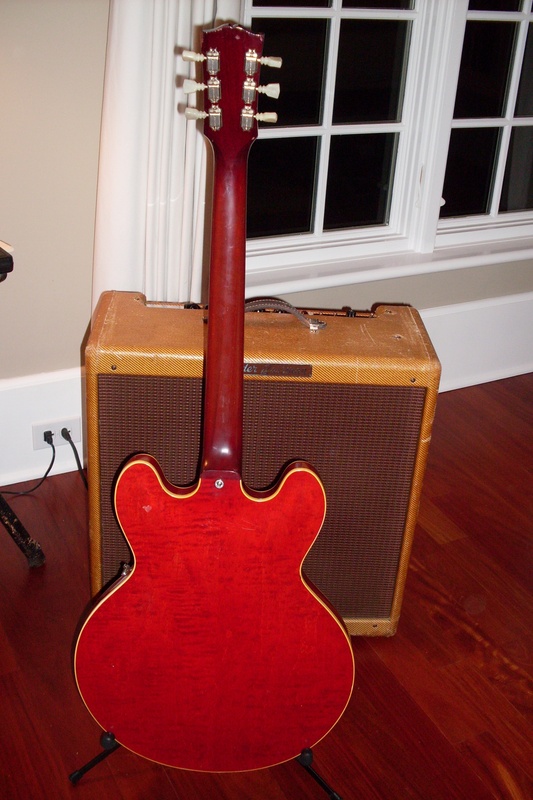 Another 59 ES-355 is A31525 which measured only .82″ at the first .91″ at the 12th. 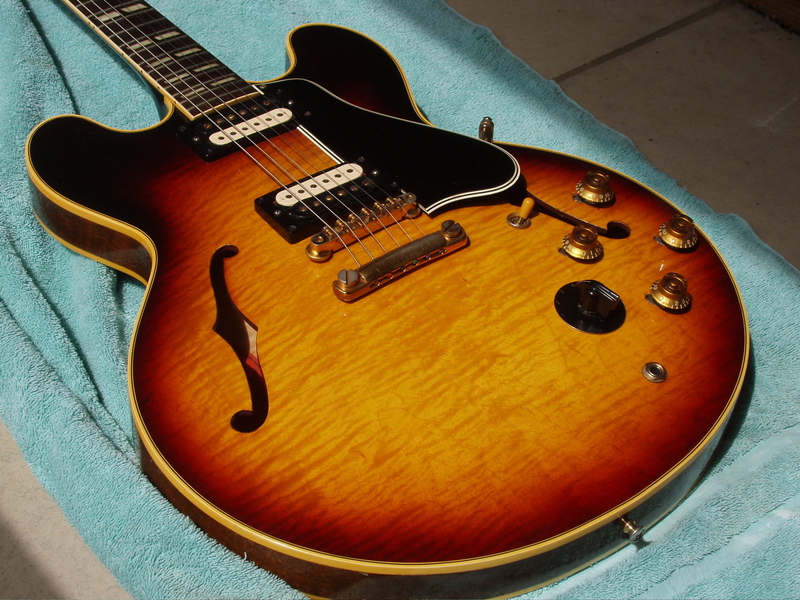 I have a 335 in the same serial number ballpark with serial number A31627 which has a first fret depth of .84″ and a 12th of .93″. It’s worth noting that 335’s and 355’s don’t follow the same timeline. The 355’s got thinner much earlier in the year. Most of us don’t get to play that many 59’s, so we tend to remember the ones we have the privilege of playing. The conventional wisdom is that a 59 has a big neck and a late 59 has a “transitional” medium neck. But as you can see, it isn’t that simple. The 59 range (at the first fret) is .83″ to .93″. That’s more range than any other year. 1960 is a good example. That same conventional wisdom says a very early 60 has a medium neck and a later one has a thin neck. That’s also generally true except that the transition comes very early in 1960. Serial A33009 is one of my all time favorites and it measures .85″ at the first fret. But just 500 numbers later is only .81″. That’s only 4 hundredths of an inch but you can certainly feel a big difference. 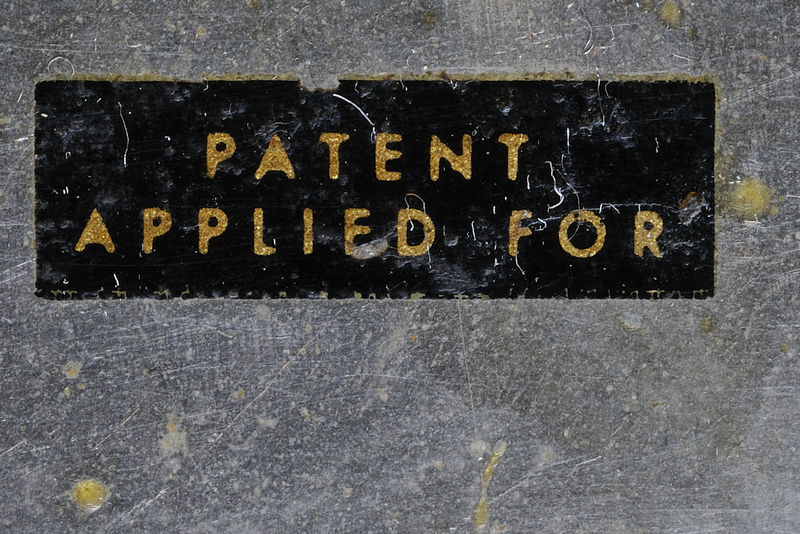 There is a problem using serial numbers to gauge the manufacture date, however. Especially in the case of ES-355’s which were a much lower volume seller. Factory order numbers present a little more accurate timeline. I have had a lot of 59’s from the S8xxx range and nearly all have had .88″ first fret necks. That includes the “first rack” 345’s (S8537) that have become so sought after. They are usually in the A296xx to A 299xx range. But the 59 ES-355 I mention above has a FON of S7625 but the serial is way later at A30877. 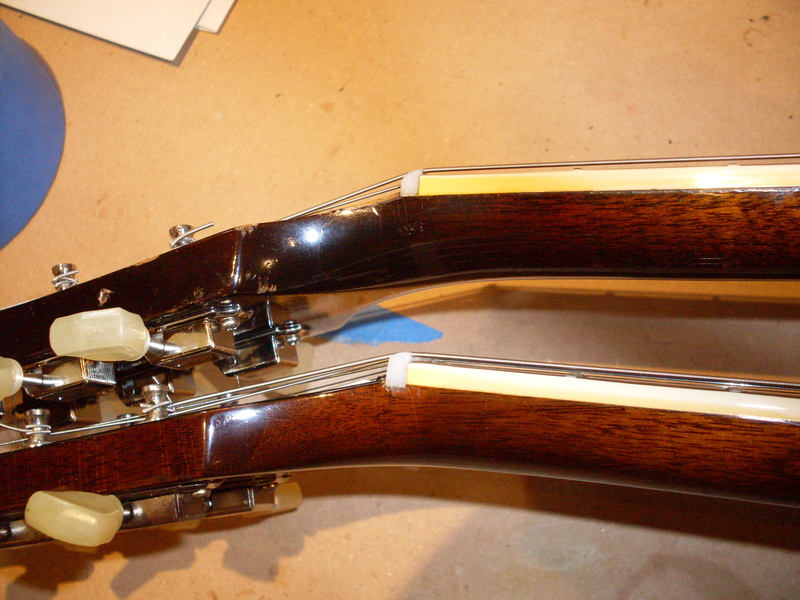 So, perhaps we should be looking more closely at FONs to get a better idea of the evolution of the 59 neck. 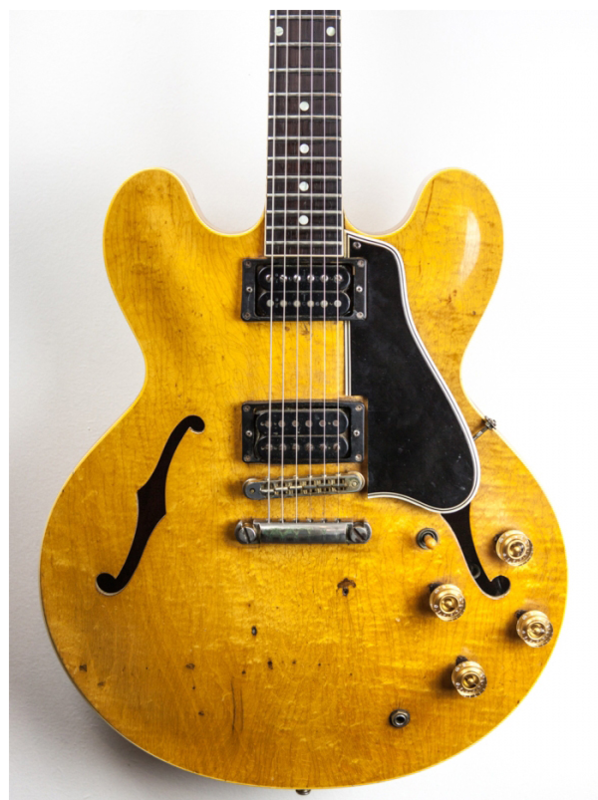 That ’59 ES-335 with the big fat .93″ neck has a 58 FON of T5490. I have been keeping a database of FONs and serial numbers and, so far, it’s not showing me much consistency in terms of features following a predictable timeline. I’d like to be able to say that big necks ended at FON S9xxx or so but it isn’t that easy. Remember FON’s go to 9999 and then start over again at 100. So, the year 1959 starts in the S66xx range and goes through S9999, restarts at S100 and ends at around S1765. In case you’re confused, read my post on FON’s here. 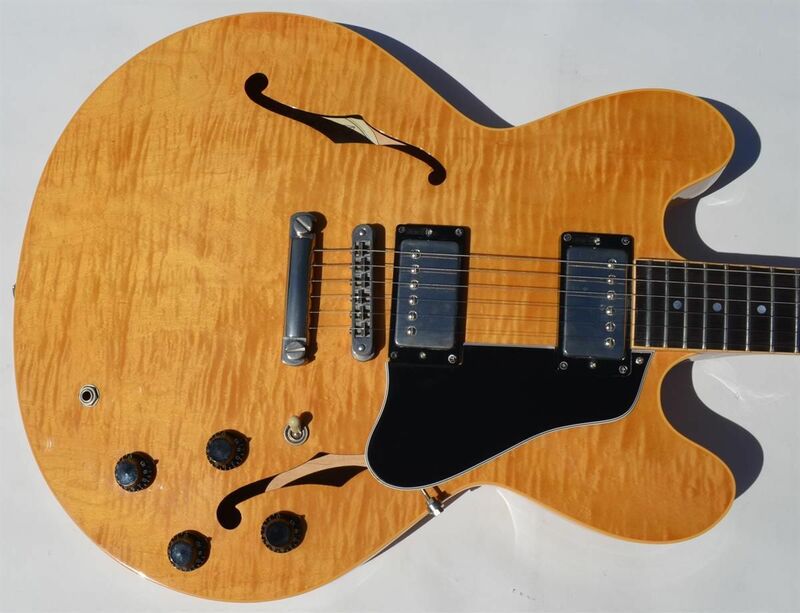 This 59 ES-345 is a real crowd pleaser even if the crowd is probably mostly Les Paul aficionados. Too bad somebody stole the pickup covers. I like a little more subtlety to my flames on a 335 and this 60 I had last year really spoke to me. Sold it to a friend so I could still play it (and look at it) once in a while. Ask the Les Paul guys what makes their guitar so special and many, if not most, will wax poetic about the flame top. They will use adjectives like insane, sick, wild, awesome and, if they can find the umlaut, über. When you ask an ES guy what makes his guitar so wonderful, it will likely be the tone. That’s not to say that LP’s don’t sound great-they do. But I wonder whether the tail has started wagging the dog with all the talk of flame. But we’re not going to talk about flamey Les Pauls. 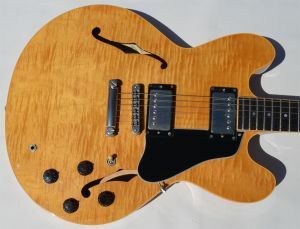 We’re going to talk about awesome, über flamey ES-335s and 345’s and 355’s. It’s interesting that “insane” flame tops command a premium among Les Paul buyers. And that goes for the originals and the reissues. How much that premium is, or should be, is kind of all over the place. Reissues for $20,000 because it’s got a great looking top seems excessive. But then, an extra $50,000 or more for a very well figured 59 seems a little excessive to me as well. I’ve certainly seen ES sellers ask for huge premiums when they have a highly figured one for sale. 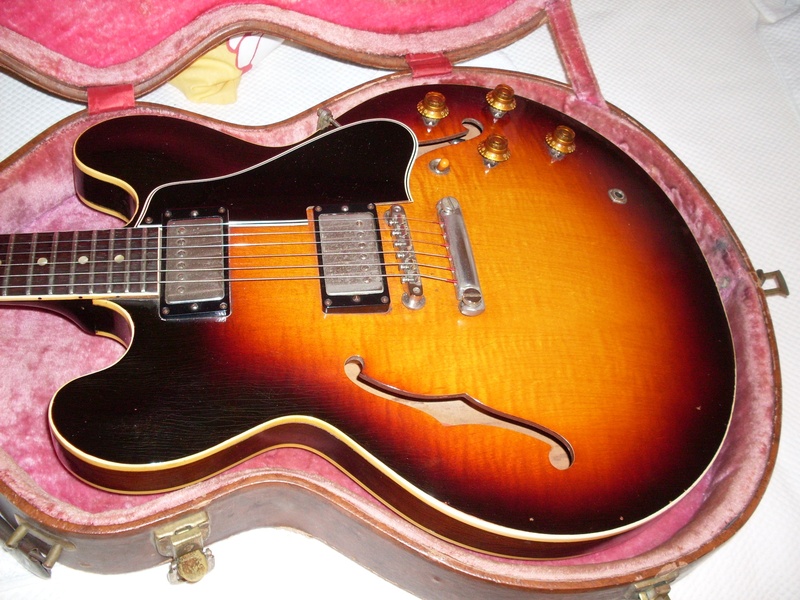 There was a very attractive 59 ES-345 out of the UK a while back that was priced at close to $30K if I’m remembering correctly. That’s about a $10,000 premium. I recently bought a very flamey ’60 and paid perhaps a $4000 premium and currently have a 59 with some serious figure that probably has a $3000 premium. So, I can’t deny that there are some real dollars attached to these figured tops (and none to the figured backs). But the larger point is that a 335, 345 or 355 can be insanely beautiful and have awesome tone without even the slightest hint of figuring. That’s what great design is all about. A 335 doesn’t need a fancy top to look great. It’s a bit like a beautiful woman. She looks great in Armani but she also looks great without it. That’s more like it for a flamed blondie. This is the Jackie Lomax 335. Unfortunately, the front of this 61 was as plain as the girl who won the spelling bee in your 6th grade class. Is this sticker real or fake? You decide. It’s getting pretty hard to tell sometimes. 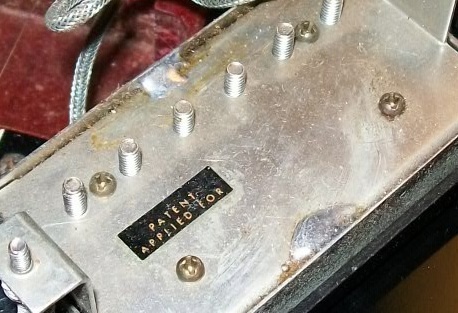 It’s a fact that plenty of Gibson humbuckers from the late 50’s and particularly the early to mid 60’s didn’t get a sticker. Whether they ran out of them or just weren’t that concerned when they reached into the pickup bin and pulled one out with no sticker, I don’t know. But there are plenty of them. In some cases, the stickers simply fall off and you can, at least, see the outline and know it was once there (although not necessarily a PAF sticker). In others, it simply never had one. I love the “philosophical” tree falls in the woods argument about whether a pickup with no sticker can be a PAF. 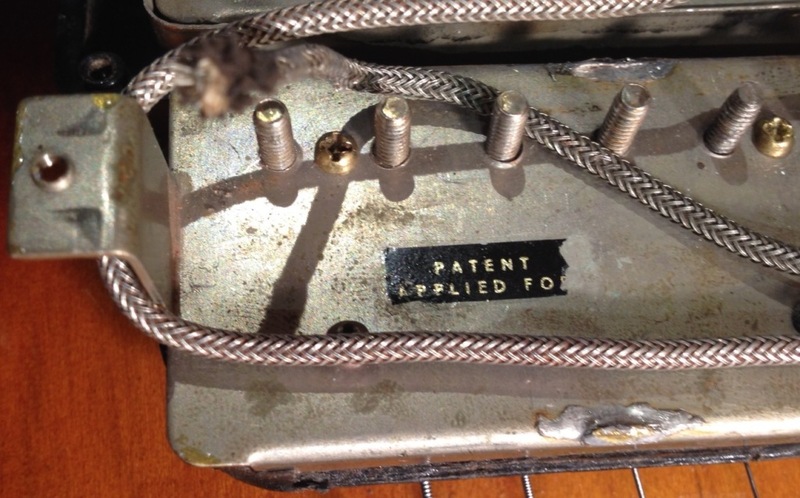 Considering an early patent and a late PAF are the exact same pickup with a different sticker…yep. Tree falls int he woods. But I want to talk about fake stickers-especially fake stickers on real PAFs. I recently bought a PAF from a dealer I really trust and when I got it, I could tell immediately that the sticker was wrong. The cover looked right, the feet had the correct tooling marks and the solder looked good too. I returned it because a fake sticker calls the entire pickup into question-even if it didn’t have one from the factory and someone decided it couldn’t hurt to put on a good repro. To my knowledge, no one has gotten the stickers right. The problem is that if they did get it right, I wouldn’t know it because it would be right. But I also figure I would see them for sale somewhere and that would tip me off. There are some really good fakes but they all seem to get something wrong. Usually it’s the font or the spacing but there are some that have that pretty much nailed. The next thing is the profile of the letters-they should be raised so you can see the dimensionality when viewed at an angle. There are fakes that got that right too. The letters should be metallic and at least some of the loops (open areas) in the “A”, “P”, “D” and “R” of “Patent Applied For” should be filled or partially filled and look kind of blobby. A few get that right as well but none seems to get it dead on. Part of the problem is that most players don’t get to see a wide range of PAFs. The stickers can age differently and they can shrink. I’ve seen stickers that look brand new and others that are virtually unreadable but they all have those same characteristics-raised metallic letter, tight spacing and blobby looking loops. There’s a pretty big range of surrounds from none at all to quite wide but not as wide as the surround on many patent number pickups. Here’s another trick that unscrupulous seller might use…If you have a PAF with a complete sticker you could cut it in half and use the other half on another pickup. They don’t come off very easily but I’m sure someone has figured out how to do that. So, be careful of partial stickers. I assume the unscrupulous seller wouldn’t be dumb enough to put both halves into the same set of pickups. Well, maybe I shouldn’t assume that. Just look very closely when part of the sticker is missing and look at both pickups together. But if it’s the real deal, it’s still the same pickup, sticker on not. The sticker doesn’t affect the tone and tone is the point. And, in general, if I get a guitar with one stickered PAF and another that isn’t and I can tell the pickups have never been out of the guitar, then I don’t worry too much about it. In a case like that, I pretty much know what it is and the sticker is a little less of an issue. 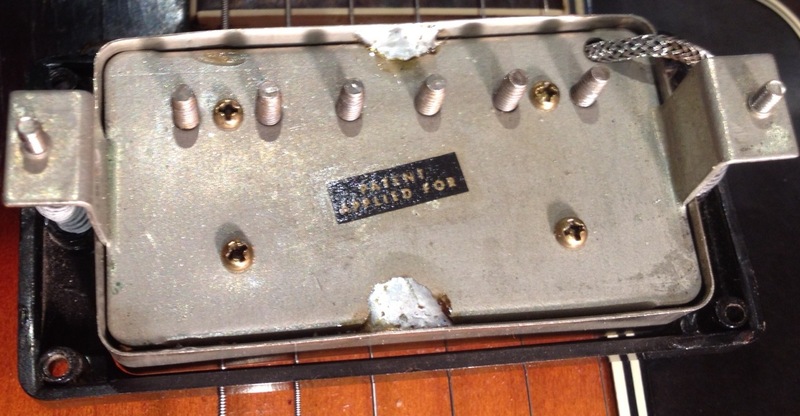 And if the pickup is opened, I can at least tell if it’s either a late PAF or an early patent and, being the exact same pickup, I suppose it doesn’t matter which it is. There are characteristics of the bobbins, the wire, the tape, the lead wires, the base plate and the screws that are distinctive. I’m sure they can all be faked and I’m sure I’ve been fooled at least once but to get everything right-including the sticker-is a tall order and I truly hope nobody ever gets it 100% right. Answers: 1) Fake 2) Real 3) Fake,no, real. no? yes? You tell me. Here’s a really good closeup of a real one. It shows pretty clearly most of what I talked about in the post.